Immigration issues, it’s nothing new…. The overriding political issue of the day in the UK in 2015 is immigration and the United Kingdom’s continued or otherwise, role in the European Union. As Prime Minister David Cameron sets out the government’s case for a renegotiation of the EU treaty we, the public, are fed daily images of migrants from Africa and the Middle East desperately trying to force open the doors of British lorries in an attempt to cross into the UK. The depth of feeling and opposing point of view could hardly be more stark and the issue has become part of the toxic soup that is the legal migration of EU citizens into the country. In recent years we have seen varying factions of the far right find the headlines before seeing their own idiocy undo themselves in what can only be described as history repeating itself. This particular part of history has shown time and again how badly those on the far side of any political persuasion end up as has been the case of the British UKIP Party who, despite winning over four million votes in the 2015 General Election continue to be derided by the press whilst continually giving a masterclass in political self-harming. This of course this is nothing new as the career of Andrew Fountaine, a leading figure of the far right suitably demonstrates. When the National Front was founded in Britain in 1967 it came on the back of repeatedly poor post-war performances by far right politicians who, in the public’s eye could not be forgiven for their default association with the German Nazi movement. Election results proved disastrous both locally and nationally despite the best attempts of Sir Oswald Mosley, by far the best known figure of the far right. Where Mosely failed, his successors fared even worse and Fountaine, the son of a Norfolk landowner presented a comical figure where it not for his extremist views. This proved to be short lived. 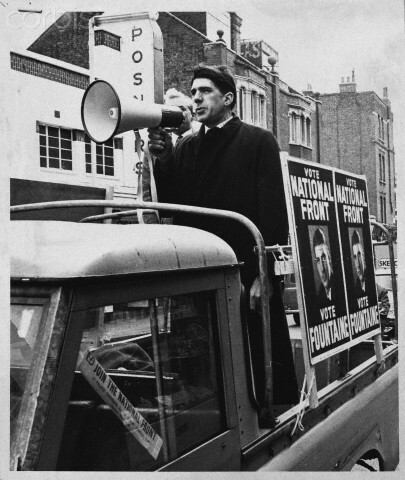 As protests and civil unrest swept throughout Europe and America in 1968, Fountaine believed a revolution in England was imminent and instructed his members to report to the police and offer their services in helping protect the country against any such disorder. Rival associate leaders such as John Tyndall and A.K Chesterton saw the potential problems in giving the police the details of their members and expelled Fountaine from the party. Despite obtaining a court order to rescind his dismissal and prompting a leadership challenge to Chesterton he was well beaten and left the party directorate in the same year. Throughout the first half of the 1970s Fountaine remained a supportive member of the party despite his misgivings at its increasing association with football hooligans. Regardless of his best efforts the NF rarely found favour with the electorate, indeed even his own mother would heckle him at his public meetings and they never truly gave the major political parties or the security services cause for real concern. In a decade renowned for its prevalent thread of racism which ran through everyday British society including its entertainment programmes, the voice of anti-immigration remained relatively low in terms of the overall political landscape and as society and its education has evolved it would seem its best chance of political success has thankfully passed. Fast forward some forty years later and little has effectively changed. For those who, following the Second World War, held a reasoned belief that immigration was a serious issue found themselves being badly misrepresented by organisations with an Island mentality who regularly played into the hands of the liberal press with increasingly idiotic and extremist views and statements. The issue today remains just as toxic with polarizing views on both sides negating any real chance of a constructive dialogue and solution to an ongoing problem. For Fountaine he did what any self-respecting ‘man of the British people’ would do and left politics in 1980 to grow trees on his estate.